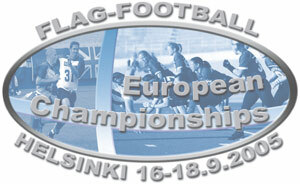 The European Championship is played with EFAF 5-on-5 Flagfootball Rules. Game time is 2x20 minutes running time. Each team will be composed of a maximum of 10 players, 2 coaches and 1 referee. All the games will be played at the Käpylä Velodrome in Helsinki. The competitions will be played on both grass and artificial grass fields, including a 5.000 seats Velodrome field for the finals on Sunday.